Invest in three one-of-a-kind sets of cufflinks by award-winning jeweller Elizabeth Gage that draw from the mints of ancient societies. Each of these unique pairs of cufflinks are set with coins from ancient societies. There are cufflink brands and then there is Elizabeth Gage MBE, an award-winning jeweller who creates, without doubt, some of the most investible and collectable pieces of fine art jewellery today, as evidenced by these three one-of-a-kind sets of cufflinks, now available on The Rake. Having scoured the delights of antiquity, Gage has creatively integrated each set with provenance-identified ancient coins, turning a functional facet of sartorial dressing into a highly collectable talking point that will elevate your formalwear look to stratospheric levels (not to mention providing instant conversation pieces). Gage's fascination with antiquarian art finds its catalyst in a long childhood illness, which left her with many hours to busy herself with reading. Thus she developed a passion for history books, developing a passion for ancient societies that has remained with her to this day, and has clearly influenced the direction of her creativity. Both her mother and grandmother were artists and Elizabeth herself studied at Chelsea School of Art. In 1963, she enrolled at the Sir John Cass College. “I was led to jewellery because a friend offered me a ring and although I knew what I wanted, I could not find it anywhere. Being a tenacious type of person, I thought if I cannot find it, I will make it!" 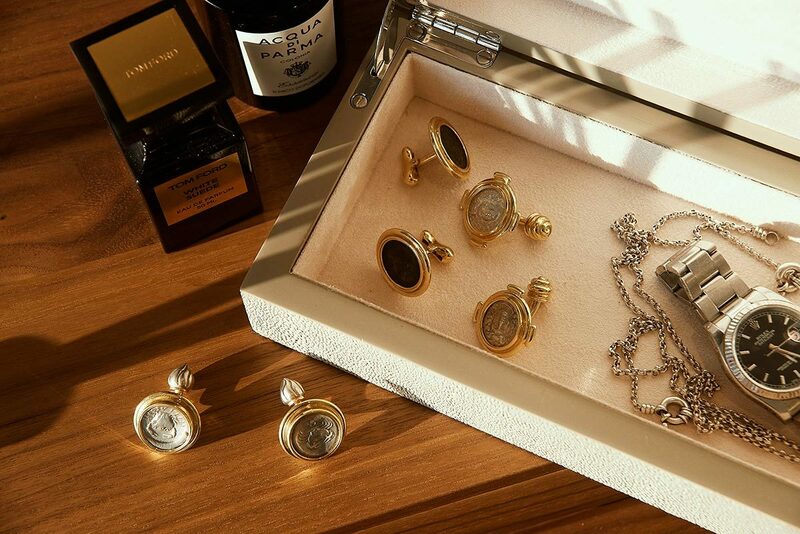 This bespoke approach her served Gage well, and will duly serve the most discerning gentlemen of today with unique and timeless cufflinks that will invariably be passed on from generation to generation. These one-of-a-kind creations by Elizabeth Gage express an undeniable individuality, which is, after all, exactly what you want from your accessories to set you apart from everyone else. To understand more about Gage's fine jewellery collections and to enquire about bespoke commissions, head over to elizabeth-gage.com.